Now that the holiday season of candy, turkey, and pies are past us, you may be finding yourself passing by our fitness room and giving it more than a second glance. If you’re like me and can’t afford a personal coach and are looking for a simple workout routines with very few equipment and some accountability, you may want to try a fitness app, such as FitBitCoach. Although you don’t need to have a Fitbit watch to use the program, it does come preloaded on certain Fitbit devices, such as the Fitbit Ionic. However, it is a stand-alone app that is available on iOS and Android, as well as in the Microsoft store. The app is free and comes with some workout routines based on your fitness level, but for $40/year, you can get even more workout routines and more features such as more customized workouts and access to Fitbit Radio with 7 stations. FitBit Coach includes video workouts and audio coaching. 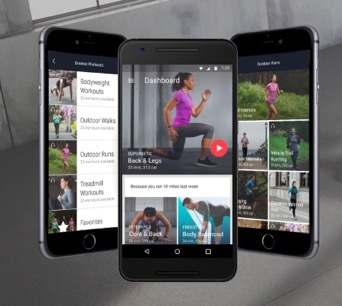 There are some other similar apps with workout programs, such as Sworkit, MyFitnessPal,7MinuteWorkoutfrom Johnson & Johnson, Nike’s Training Club, and WorkOutTrainer. For those looking for more activity-specific fitness apps, there are several apps for runners like RunKeeperor Strava, which is good for cyclists as well. There are also apps for Yoga practitioners such as YogaGlo. If you are looking for a weight loss and fitness tracker, you may want to check out LoseIt!.